Would you say that you’re generally a happy person? What is it that cheers you up? We sell a range of pet products, so we wanted to look at how our furry friends can help us through difficult days and challenging life events. With Blue Monday, the most depressing day of the year, just around the corner, there are a lot of us who may be feeling down in the run up to 21 January. But what is it that’s making us sad? And how can our pets help? One of the major reasons for our sadness could be because of a break-up. We’ve just passed 11 December, which is the date most relationships apparently come to an end. Statisticians analysed break-up statuses on Facebook to see what the most common date was for being dumped and they discovered that this day, two weeks before Christmas, is when most couples decide to end their relationship. However, we’re yet to reach January. There are those who see the festive season through before making the decision to part ways with their partner. In fact, the first month of the year is famous for relationships falling apart, with divorce lawyers admitting that they see a flurry of filings in January and February. If you and your partner break up in the new year, who gets to keep the pet you share is a significant issue. Pets are proven to make us happy, and there’s a real risk of happiness diminishing as a result of losing out on getting custody of them. 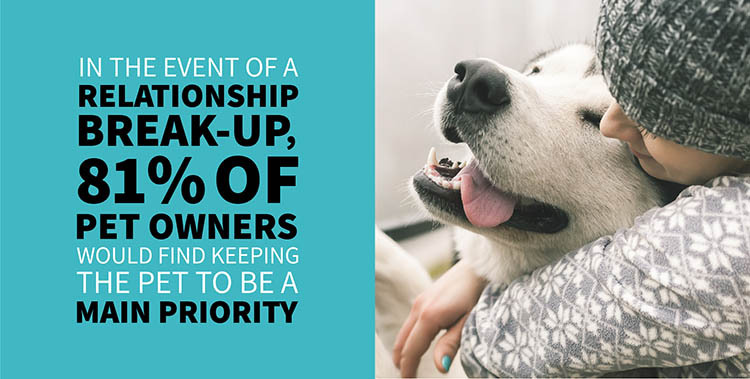 With this in mind, it makes sense for us to take the animals we own very seriously – so much so that in the event of a relationship break-up, 81% of us would find keeping the pet to be the main priority over anything else. So, it’s easy to see why pets play such a big part during life-changing moments such as these. With so much emphasis placed on the pets, deciding who gets to take custody of the dog involves a lot of negotiations and the ability to compromise. Often, it’s agreed that couples will have shared custody of their pet. However, for acrimonious splits, this can often be the most heart-breaking part of the break-up: “To be fair there isn’t much of a story. He kept the dog and I was really sad!” says one former joint dog owner who went through a separation. 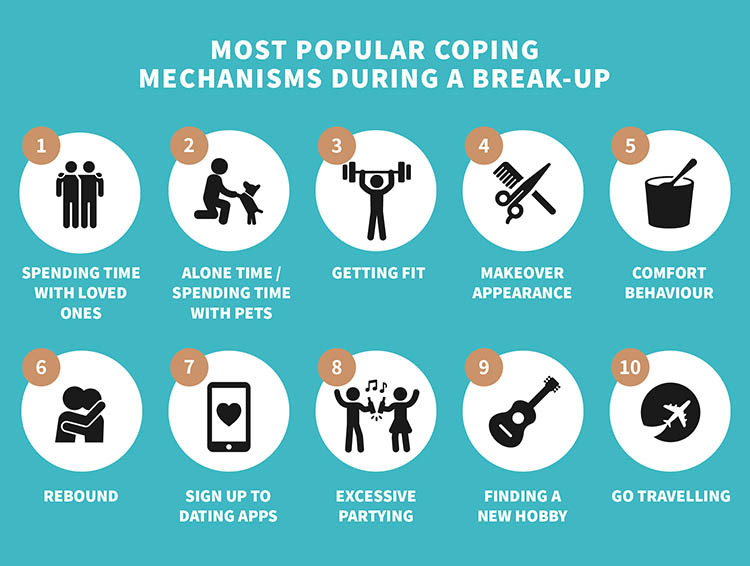 New singletons may turn to various coping mechanisms for getting through those early days. Spending some alone time and being comforted by pets was found to be the second-most popular form of comfort - number one was spending time with loved ones, and getting fit came in third place. During a break-up, emotions are likely to be running high… the now-exes might swing from sadness to elation before feeling revitalised and lonely. This rollercoaster of feelings and reactions can have an effect on those around them, including pets. How you go about getting through a break-up will influence pets as they also deal with a change in ownership. Professionals have their own take on what happens to our pets in the event of a break-up: “The primitive brain that animals have like routine, familiarity and consistency,” explains Dipti Tait, a hypnotherapist and behaviour expert. “This part of the brain is also very associative and responds to triggers easily (like tapping on the food bowl). When there is a disruption to this (such as during a relationship breakdown, where an owner’s familiar face becomes an absent one), it can cause anxiety and stress for our pets.” Vet advice also suggests that the animal should go with their ‘alpha’ where possible. On average, over half (51%) of pet owners would rank their happiness levels at eight or above. When this is compared with just 39% of non-pet owners placing their happiness over the eight mark, it’s clear that animals can make a real difference to how we feel. Our pets clearly mean the world to us, and in the fallout of a relationship breakdown they are the things that make a difference to our moods. When asked how animals make us feel, 91% used words that were overwhelmingly positive, including “affection”, “content”, “loved” and “comforted”, proving how much of an effect they have on our emotions. Whether we choose them for companionship (49% revealed they get their pets for this reason), improving happiness (18%) or exercise (12%), they’re a significant part of our lives and are a key member of the family. Their wellbeing in the event of a break-up is just as important as their owners. Has your pet ever helped you through a difficult time? Do your pets help to improve your mood, and make you feel happier?